For other uses, see Town (disambiguation). The town of Mecca in the Arabian Peninsula, before its inflation, in 1880. A town is a human settlement. Towns are generally larger than villages but smaller than cities, though the criteria to distinguish them vary considerably between different parts of the world. The word town shares an origin with the German word Zaun, the Dutch word tuin, and the Old Norse tun. The German word Zaun comes closest to the original meaning of the word: a fence of any material. An early borrowing from Celtic *dunom (cf. Old Irish dun, Welsh din "fortress, fortified place, camp," dinas "city"). In English and Dutch, the meaning of the word took on the sense of the space which these fences enclosed. In England, a town was a small community that could not afford or was not allowed to build walls or other larger fortifications, and built a palisade or stockade instead. In the Netherlands, this space was a garden, more specifically those of the wealthy, which had a high fence or a wall around them (like the garden of the palace of Het Loo in Apeldoorn, which was the model for the privy garden of William III and Mary II at Hampton Court). In Old Norse tun means a (grassy) place between farmhouses, and the word is still used in a similar meaning in modern Norwegian. In Old English and Early and Middle Scots, the words ton, toun, etc. could refer to diverse kinds of settlements from agricultural estates and holdings, partly picking up the Norse sense (as in the Scots word fermtoun) at one end of the scale, to fortified municipalities. If there was any distinction between toun (fortified municipality) and burgh (unfortified municipality) as claimed by some[who? ], it did not last in practice as burghs and touns developed. For example, "Edina Burgh" or "Edinburgh" (called a city today) was built around a fort and eventually came to have a defensive wall. In some cases, "town" is an alternative name for "city" or "village" (especially a larger village). Sometimes, the word "town" is short for "township". In general, today towns can be differentiated from townships, villages, or hamlets on the basis of their economic character, in that most of a town's population will tend to derive their living from manufacturing industry, commerce, and public services rather than primary industry such as agriculture or related activities. A place's population size is not a reliable determinant of urban character. In many areas of the world, e.g. in India at least until recent times, a large village might contain several times as many people as a small town. In the United Kingdom, there are historical cities that are far smaller than the larger towns. The modern phenomenon of extensive suburban growth, satellite urban development, and migration of city dwellers to villages has further complicated the definition of towns, creating communities urban in their economic and cultural characteristics but lacking other characteristics of urban localities. Some forms of non-rural settlement, such as temporary mining locations, may be clearly non-rural, but have at best a questionable claim to be called a town. Towns often exist as distinct governmental units, with legally defined borders and some or all of the appurtenances of local government (e.g. a police force). In the United States these are referred to as "incorporated towns". In other cases the town lacks its own governance and is said to be "unincorporated". Note that the existence of an unincorporated town may be legally set out by other means, e.g. zoning districts. In the case of some planned communities, the town exists legally in the form of covenants on the properties within the town. The United States Census identifies many census-designated places (CDPs) by the names of unincorporated towns which lie within them; however, those CDPs typically include rural and suburban areas and even surrounding villages and other towns. The distinction between a town and a city similarly depends on the approach: a city may strictly be an administrative entity which has been granted that designation by law, but in informal usage, the term is also used to denote an urban locality of a particular size or importance: whereas a medieval city may have possessed as few as 10,000 inhabitants, today some[who?] consider an urban place of fewer than 100,000 as a town, even though there are many officially designated cities that are much smaller than that. In Afghanistan, towns and cities are known as shār (Dari: شهر, Pashto: ښار). As the country is an historically rural society with few larger settlements, with major cities never holding more than a few hundred thousand inhabitants before the 2000s, the lingual tradition of the country does not discriminate between towns and cities. In Albania "qytezë" means town, which is very similar with the word for city ("qytet"). Although there is no official use of the term for any settlement. In Albanian "qytezë" means "small city" or "new city", while in ancient times "small residential center within the walls of a castle". In Australia, towns or "urban centre localities" are commonly understood to be those centers of population not formally declared to be cities and having a population in excess of about 200 people. Centers too small to be called towns are generally understood to be a township. In addition, some local government entities are officially styled as towns in Queensland, Western Australia and the Northern Territory, and before the statewide amalgamations of the 1990s in Victoria some local government entities were styled as towns, but now towns are only localities that contain an urban centre with a population greater than 200. The Austrian legal system does not distinguish between villages, towns, and cities. The country is partitioned into 2098 municipalities (German: Gemeinden) of fundamentally equal rank. Larger municipalities are designated as market towns (German: Marktgemeinden) or cities (Städte), but these distinctions are purely symbolic and do not confer additional legal responsibilities. There is a number of smaller communities that are labelled cities because they used to be regional population centers in the distant past. The city of Rattenberg for example has about 400 inhabitants. The city of Hardegg has about 1200 inhabitants, although the historic city core − Hardegg proper without what used to be the surrounding hamlets − is home to just 80 souls. There are no unincorporated areas. Of the 201 cities in Austria, 15 are statutory cities (Statutarstädte). A statutory city is a city that is vested, in addition to its purview as a municipality, with the duties of a district administrative authority. The status does not come with any additional autonomy: district administrative authorities are essentially just service centers that citizens use to interact with the national government, for example to apply for driver licenses or passports. The national government generally uses the provinces to run these points of contact on its behalf; in the case of statutory cities, the municipality gets to step up. Bulgarians do not, in general, differentiate between 'city' and 'town'. However, in everyday language and media the terms "large towns" and "small towns" are in use. "Large towns" usually refers to Sofia, Plovdiv, Varna and Burgas, which have population over 200,000. Ruse and Stara Zagora are often included as well due to presence of relatively developed infrastructure and population over 100,000 threshold. It is difficult to call the remaining provincial capitals "large towns" as, in general, they are less developed and have shrinking population, some with as few as 30,000 inhabitants. In Bulgaria the Council of Ministers defines what constitutes a settlement, while the President of Bulgaria grants each settlement its title. In 2005 the requirement that villages that wish to classify themselves as town must have a social and technical infrastructure, as well as a population of no fewer than 3500 people. For resort settlements the requirements are lower with the population needing to be no fewer than 1000 people but infrastructure requirements remain. The legal definition of a town in Canada varies by province or territory, as each has jurisdiction over defining and legislating towns, cities and other types of municipal organization within its own boundaries. The province of Quebec is unique in that it makes no distinction under law between towns and cities. There is no intermediate level in French between village and ville (municipality is an administrative term usually applied to a legal, not geographical entity), so both are combined under the single legal status of ville. While an informal preference may exist among English speakers as to whether any individual ville is commonly referred to as a city or as a town, no distinction and no objective legal criteria exist to make such a distinction under law. In Chile, towns (Spanish: pueblos) are defined by the National Statistics Institute (INE) as an urban entity with a population from 2001 to 5000 or an area with a population from 1001 to 2000 and an established economic activity. In the Czech Republic, the word město (city) is used for very wide variety of municipalities, ranging from Prague, the largest and capital city with approximately 1.2 million inhabitants, to the smallest, Přebuz, with just 74 inhabitants. Technically, a municipality must have at least 3,000 inhabitants to be granted the město title, although many smaller municipalities, especially some former mining towns, retain the title město for historic reasons. Currently, approximately 192 of the 592 města have less than 3,000 inhabitants. Some municipalities have been amalgamated together, such that the whole is considered as a město. Statutory cities (statutární město), which are defined by law no. 128/2000 Coll., can define their own self-governing municipal districts.. There are 25 such cities, in addition to Prague, which is a de facto statutory city. In 2006, the legal concept of a town (městys, or formerly městečko) was reintroduced. Currently, around 213 municipalities hold the title městys. Municipalities which do not qualify as a město or a městys default to the title of obec (a municipality) or, unofficially, a vesnice (village), even though they may consist of one or more villages. In Denmark, in many contexts no distinction is made between "city", "town" and "village"; all three translate as "by". In more specific use, for small villages and hamlets the word "landsby" (meaning "country town") is used, while the Danish equivalent of English "city" is "storby" (meaning "large town"). For formal purposes, urban areas having at least 200 inhabitants are counted as "by". Historically some towns held various privileges, the most important of which was the right to hold market. They were administered separately from the rural areas in both fiscal, military and legal matters. Such towns are known as "købstad" (roughly the same meaning as "borough" albeit deriving from a different etymology) and they retain the exclusive right to the title even after the last vestiges of their privileges vanished through the reform of the local administration carried through in 1970. In Estonia, there is no distinction between a town and a city as the word linn is used for both bigger and smaller settlements, which are bigger than villages and boroughs. There are 30 municipal towns (omavalitsuslik linn) in Estonia and a further 17 towns, which have merged with a municipal parish (vallasisene linn). From an administrative standpoint, the smallest level of local authorities are all called "communes". However, some laws do treat these authorities differently based on the population and different rules apply to the three big cities Paris, Lyon and Marseille. For historical reasons, six communes in the Meuse département exist as independent entities despite having no inhabitant at all. For statistical purposes, the national statistical institute (INSEE) operates a distinction between urban areas with fewer than 2,000 inhabitants and bigger communes, the latter being called "villes". Smaller settlements are usually called "villages". The French term for "town" is "bourg" but in fact, the French laws do not really distinguish between towns and cities which are all commonly called "villes". Germans do not, in general, differentiate between 'city' and 'town'. The German word for both is Stadt, as it is the case in many other languages that do not differentiate between these Anglo-Saxon concepts. 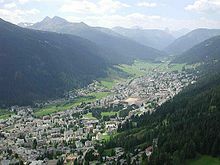 The word for a 'village', as a smaller settlement, is Dorf. However, the International Statistics Conference of 1887 defined different sizes of Stadt, based on their population size, as follows: Landstadt ("country town"; under 5,000), Kleinstadt ("small town"; 5,000 to 20,000), Mittelstadt ("middle town"; between 20,000 and 100,000) and Großstadt ("large town"; over 100,000). The term Großstadt may be translated as "city". In addition, Germans may speak of a Millionenstadt, a city with over one million inhabitants (such as Munich, Hamburg and Berlin). Historically, many settlements became a Stadt by being awarded a Stadtrecht in medieval times. In modern German language use, the historical importance, the existence of central functions (education, retail etc.) and the population density of an urban place might also be taken as characteristics of a Stadt. The modern local government organisation is subject to the laws of each state and refers to a Gemeinde (municipality), regardless of its historic title. While most Gemeinden form part of a Landkreis (district) on a higher tier of local government, larger towns and cities may have the status of a kreisfreie Stadt, combining both the powers of a municipality and a district. Designations in different states are as diverse as e.g. in Australian States and Territories, and differ from state to state. In some German states, the words Markt ("market"), Marktflecken (both used in southern Germany) or Flecken ("spot"; northern Germany e.g. in Lower Saxony) designate a town-like residential community between Gemeinde and Stadt with special importance to its outer conurbation area. Historically those had Marktrecht (market right) but not full town privileges; see Market town. The legal denomination of a specific settlement may differ from its common designation (e.g. Samtgemeinde – a legal term in Lower Saxony for a group of villages [Dorf, pl. Dörfer] with common local government created by combining municipalities [Gemeinde, pl. Gemeinden]). In written speech, Greeks use the word πόλη (póli) to express 'city' and the word κωμόπολη (komópoli) to express 'town', both with a feminine grammatical gender. For Greeks, a town (komópoli) is a human settlement with a population of 2,000–9,999. If a settlement has a lower population, it is considered a village (χωριό, chorjó). For the cities, Greeks, use the word 'póli', whereas for bigger cities with a population above 1 million, they usually use another name, μητρόπολη (mitrópoli), in English Metropolis. In the Greek speaking world (Greece and Cyprus) only Athens and Salonica can be described as "metropoleis". In spoken speech, Greeks use the word for village to refer both to villages and towns and the word for city to refer to both cities and metropoleis. Nearly every town in Hong Kong has its own town hall. The picture shows the Sha Tin Town Hall in the town of Sha Tin. Hong Kong started developing new towns in the 1950s, to accommodate exponential population increase. The very first new towns included Tsuen Wan and Kwun Tong. In the late 1960s and the 1970s, another stage of new town developments was launched. Nine new towns have been developed so far. Land use is carefully planned and development provides plenty of room for public housing projects. Rail transport is usually available at a later stage. The first towns are Sha Tin, Tsuen Wan, Tuen Mun and Tseung Kwan O. Tuen Mun was intended to be self-reliant, but was not successful and turned into a bedroom community like the other new towns. More recent developments are Tin Shui Wai and North Lantau (Tung Chung-Tai Ho). In Hungary there is no official distinction between a city and a town (the word for both in Hungarian is: város). Nevertheless, the expressions formed by adding the adjectives "kis" (small) and "nagy" (large) to the beginning of the root word (e.g. "nagyváros") have been normalized to differentiate between cities and towns (towns being smaller, therefore bearing the name "kisváros".) In Hungary, a village can gain the status of "város" (town), if it meets a set of diverse conditions for quality of life and development of certain public services and utilities (e.g. having a local secondary school or installing full-area sewage collection pipe network). Every year the Minister of Internal Affairs selects candidates from a committee-screened list of applicants, whom the President of Republic usually affirms by issuing a bill of town's rank to them. Since being a town carries extra fiscal support from the government, many relatively small villages try to win the status of "városi rang" nowadays. Before the fall of communism in 1990, Hungarian villages with fewer than 10,000 residents were not allowed to become towns. Recently some settlements as small as 2,500 souls have received the rank of town (e.g. Visegrád, Zalakaros or Gönc) and meeting the conditions of development is often disregarded to quickly elevate larger villages into towns. As of middle 2013, there are 346 towns in Hungary, encompassing some 69% of the entire population. Towns of more than 50,000 people are able to gain the status of "megyei jogú város" (town with the rights of a county), which allows them to maintain a higher degree of services. (There are a few exceptions, when towns of fewer than 50,000 people gained the status: Érd, Hódmezővásárhely, Salgótarján and Szekszárd) As of middle 2013, there are only 23 such towns in Hungary. The Local Government act 2001 provides that from January 1, 2002 (section 10 subsection (3) Within the county in which they are situated and of which they form part, there continue to be such other local government areas as are set out in Schedule 6 which – (a) in the case of the areas set out in Chapter 1 of Part 1 of that Schedule, shall be known as boroughs, and – (b) in the case of the areas set out in Chapter 2 of Part 1 and Part 2 of that Schedule, shall be known as towns, and in this Act a reference to a town shall include a reference to a borough. The reference to town having a population of at least 7,500 as ascertained at the last preceding census hands much of the power relating to defining what is in fact a town over to the Central Statistics Office and their criteria are published as part of each census. A local area plan shall be made in respect of an area which —(i) is designated as a town in the most recent census of population, other than a town designated as a suburb or environs in that census, (ii) has a population in excess of 2,000, and (iii) is situated within the functional area of a planning authority which is a county council. These are set out in full at 2006 Census Appendices. In short they speak of "towns with legally defined boundaries" ( i.e. those established by the Local Government Act 2001) and the remaining 664 as "census towns", defined by themselves since 1971 as a cluster of 50 or more occupied dwellings in which within a distance of 800 meters there is a nucleus of 30 occupied houses on both sides of the road or twenty occupied houses on one side of the road there is also a 200 meter criterion for determining whether a house is part of a census town. Density of population at least 400/km2. (1,000 per sq. mile). All the statutory towns, census towns and out growths are considered as urban settlements, as opposed to rural areas. In contemporary Persian texts, no distinction is made between "city" and "town"; both translate as "Shahr" (شهر). In older Persian texts (until the first half of the 20th century), the Arabic word "Qasabeh" (قصبه) was used for a town. However, in recent 50 years, this word has become obsolete. There is a word in Persian which is used for special sort of satellite townships and city neighborhoods. It is Shahrak (شهرک), (lit. : small city). Another smaller type of town or neighborhood in a big city is called Kuy (کوی). Shahrak and Kuy each have their different legal definitions. Large cities such as Tehran, Mashhad, Isfahan, Tabriz, etc. which have millions of populations are referred to as Kalan-shahrکلان‌شهر (metropole). The pace in which different large villages have gained city status in Iran shows a dramatic increase in the last two decades. Bigger cities and towns usually are centers of a township (in Persian: Shahrestan (شهرستان). Shahrestan itself is a subdivision of Ostan استان (Province). Peel is also sometimes referred to as a city by virtue of its cathedral. Onchan and Port Erin are both larger in population than the smallest "town", having expanded in modern times, but are designated as villages. Modern Hebrew does provide a word for the concept of a town: Ayara (עיירה), derived from Ir (עיר), the biblical word for "city". However, the term ayara is normally used only to describe towns in foreign countries, i.e. urban areas of limited population, particularly when the speaker is attempting to evoke nostalgic or romantic attitudes. The term is also used to describe a Shtetl, a pre-Holocaust Eastern European Jewish town. Within Israel, established urban areas are always referred to as cities (with one notable exception explained below) regardless of their actual size. Israeli law does not define any nomenclature for distinction between urban areas based on size or any other factor – meaning that all urban settlements in Israel are legally referred to as "cities". The exception to the above is the term Ayeret Pituakh (עיירת פיתוח, lit. "Development Town") which is applied to certain cities in Israel based on the reasons for their establishment. These cities, created during the earlier decades of Israeli independence (1950s and 1960s, generally), were designed primarily to serve as commercial and transportation hubs, connecting smaller agricultural settlements in the northern and southern regions of the country (the "Periphery") to the major urban areas of the coastal and central regions. Some of these "development towns" have since grown to a comparatively large size, and yet are still referred to as "development towns", particularly when the speaker wishes to emphasize their (often low) socio-economic status. Nonetheless, they are rarely (if ever) referred to simply as "towns"; when referring to one directly, it will be called either a "development town" or a "city", depending on context. Although Italian provides different words for city (città), town (paese) and village (villaggio, old-fashioned, or frazione, most common), no legal definitions exist as to how settlements must be classified. Administratively, both towns and cities are ruled as comuni/comunes, while villages might be subdivisions of the former. Generally, in everyday's speech, a town is larger or more populated than a village and smaller than a city. Various cities and towns together may form a metropolitan area (area metropolitana). A city, can also be a culturally, economically or politically prominent community with respect to surrounding towns. Moreover, a city can be such by Presidential decree. A town, in contrast, can be an inhabited place which would elsewhere be styled a city, but has not received any official recognition. Remarkable exceptions do exist: for instance, Bassano del Grappa, was given the status of "città" in 1760 by Francesco Loredan's dogal decree and has since then carried this title. Also, the Italian word for town (paese with lowercase P) must not be confused with the Italian word for country/nation (Paese usually with uppercase P). In Japan city status (shi) was traditionally reserved for only a few particularly large settlements. Over time however the necessary conditions to be a city have been watered down and today the only loose rules that apply are having a population over 50,000 and over 60% of the population in a "city centre". In recent times many small villages and towns have merged in order to form a city despite seeming geographically to be just a collection of villages. The distinction between towns (machi/chō) and villages (mura/son) is largely unwritten and purely one of population size when the settlement was founded with villages having under 10,000 and towns 10,000–50,000. In both of South Korea and North Korea, towns are called eup (읍). In Latvia, towns and cities are indiscriminately called pilsēta in singular form. The name is a contraction of two Latvian words: pils (castle) and sēta (fence), making it very obvious what is meant by the word – what is situated between the castle and the castle fence. However, a city can be called lielpilsēta in reference to its size. A village is called ciemats or ciems in Latvian. In Lithuanian, a city is called miestas, a town is called miestelis (literally "small miestas). Metropolis is called didmiestis (literally "big miestas). In Malaysia, a town is the area administered by Municipal Council (Malay: Majlis Perbandaran). Before 1848 there was a legal distinction between stad and non-stad parts of the country, but the word no longer has any legal significance. About 220 places were granted stadsrechten (city rights) and are still so called for historical and traditional reasons, though the word is also used for large urban areas that never obtained such rights. Because of this, in the Netherlands, no distinction is made between "city" and "town"; both translate as stad. A hamlet (gehucht) usually has fewer than 1,000 inhabitants, a village (dorp) ranges from 1,000 up to 25,000 inhabitants, and a place above 25,000 can call itself either village or city, mostly depending on historic reasons or size of the place. As an example, The Hague never gained city rights, but because of its size - more than half a million inhabitants - it is regarded as a city. Staverden, with only 40 inhabitants, would be a hamlet, but because of its city rights it may call itself a city. Only Amsterdam, Rotterdam, The Hague and Utrecht are regarded as a grote stad. In New Zealand, a town is a built-up area that is not large enough to be considered a city. Historically, this definition corresponded to a population of between approximately 1,000 and 20,000. Towns have no independent legal existence, being administered simply as built-up parts of districts, or, in some cases, of cities. New Zealand's towns vary greatly in size and importance, ranging from small rural service centres to significant regional centres such as Blenheim and Taupo. Typically, once a town reaches a population of somewhere between 20,000 and 30,000 people, it will begin to be informally regarded as a city. One who regards a settlement as too small to be a town will typically call it a "township" or "village." In Norway, "city" and "town" both translate to "by", even if a city may be referred to as "storby" ("large town"). They will all be part of and administered as a "kommune" ("municipality"). The town center of Loboc, Bohol. In the Philippines, the local official equivalent of the town is the municipality (Filipino bayan). Every municipality, or town, in the country has a mayor (Filipino alkalde) and a vice mayor (Filipino bise alkalde) as well as local town officials (Sangguniang Bayan). Philippine towns, otherwise called as municipalities, are composed of a number of villages and communities called barangays with one (or a few cluster of) barangay(s) serving as the town center or poblacion. Unique in Philippine towns is that they have fixed budget, population and land requirements to become as such, i.e. from a barangay, or a cluster of such, to a town, or to become cities, i.e. from town to a city. Respectively, examples of these are the town of B.E. Dujali in Davao del Norte province, which was formed in 1998 from a cluster of 5 barangays, and the city of El Salvador, which was converted from a town to a city in 2007. Each town in the Philippines was classified by its annual income and budget. A sharp, hierarchical distinction exists between Philippine cities (Filipino lungsod or siyudad) and towns, as towns in the country are juridically separate from cities, which are typically larger and more populous (some smaller and less populated) and which political and economic status are above those of towns. This was further supported and indicated by the income classification system implemented by the National Department of Finance, to which both cities and towns fell into their respective categories that indicate they are such as stated under Philippine law. However, both towns and cities equally share the status as local government units (LGU's) grouped under and belong to provinces and regions; both each are composed of barangays and are governed by a mayor and a vice mayor supplemented by their respective LGU legislative councils. Similarly to Germany and Sweden, in Poland there is no linguistic distinction between a city and a town. The word for both is miasto, as a form of settlement distinct from following: village (wieś), hamlet (przysiółek), settlement (osada), or colony (kolonia). Town status is conferred by administrative decree, new towns are announced by the Government in a separate Bill effective from the first day of the year. Some settlements tend to remain villages even though they have a larger population than many smaller towns. Town may be called in diminutive way as "miasteczko", what is colloquially used for localities with a few thousand residents. Such localities have usually a Mayor (burmistrz) as a chief of town council. Cities are the biggest localities, generally must be bigger than 100 thousand of residents, they are ruled by President (prezydent) as a chief of City Council. There are bare a few (mainly historic or political) exemptions which have allowed towns lesser than 100 thousand of people, to obtain President title for their Mayors, and to become recognized as Cities that way. Just to name a few: Bolesławiec, Gniezno, Zamość. In this context, the town or city is subordinate to the local authority (civil parish or municipality, in comparison to the North American context, where they have political functions. In special cases, some villages may be granted the status of town if they possess historical, cultural or architectonic importance. The Portuguese urban settlements heraldry reflects the difference between towns and cities, with the coat of arms of a town bearing a crown with 4 towers, while the coat of arms of a city bears a crown with 5 towers. This difference between towns and cities is still in use in other Portuguese speaking countries, but in Brazil is no longer in use. In Romania there is no official distinction between a city and a town (the word for both in Romanian is: oraş). Cities and towns in Romania can have the status either of oraş municipiu, conferred to large urban areas, or only oraş to smaller urban localities. Some settlements remain villages (communes) even though they have a larger population than other smaller towns. Unlike English, the Russian language does not distinguish the terms "city" and "town"—both are translated as "город" (gorod). Occasionally the term "город" is applied to urban-type settlements as well, even though the status of those is not the same as that of a city/town proper. In Russia, the criteria an inhabited locality needs to meet in order to be granted city/town (gorod) status vary in different federal subjects. In general, to qualify for this status, an inhabited locality should have more than 12,000 inhabitants and the occupation of no less than 85% of inhabitants must be other than agriculture. However, inhabited localities which were previously granted the city/town status but no longer meet the criteria can still retain the status for historical reasons. In Singapore, towns are large scale satellite housing developments which are designed to be self contained. It includes public housing units, a town centre and other amenities. Helmed by a hierarchy of commercial developments, ranging from a town centre to precinct-level outlets, there is no need to venture out of town to meet the most common needs of residences. Employment can be found in industrial estates located within several towns. Educational, health care, and recreational needs are also taken care of with the provision of schools, hospitals, parks, sports complexes, and so on. The most populous town in the country is Bedok. Bishan, one of Singapore's towns is the 38th biggest in terms of geographical size and the 21st most populated planning area in the country. In South Africa the Afrikaans term "Dorp" is used interchangeably with the English equivalent of "Town". A "town" is a settlement that has a size that is smaller than that of a city. In Spain, the equivalent of town would be villa, a population unit between a village (pueblo) and a city (ciudad), and is not defined by the number of inhabitants, but by some historical rights and privileges dating from the Middle Ages, such as the right to hold a market or fair. For instance, while Madrid is technically a villa, Barcelona, with a smaller population, is known as a city. View towards St Mary's Cathedral in Visby, Sweden. Visby is one of the most well-preserved former Hanseatic cities in Sweden and a UNESCO World Heritage Site. Today it is the seat of Gotland Municipality. The Swedish language does not differentiate between towns and cities in the English sense of the words; both words are commonly translated as stad, a term which has no legal significance today. The term tätort is used for an urban area or a locality, which however is a statistical rather than an administrative concept and encompasses densely settled villages with only 200 inhabitants as well as the major cities. The word köping corresponds to an English market town (chipping) or German Markt but is mainly of historical significance, as the term is not used today and only survives in some toponyms. Some towns with names ending in -köping are cities with over 100 000 inhabitants today, e.g. Linköping. Before 1971, 132 larger municipalities in Sweden enjoyed special royal charters as stad instead of kommun (which is similar to a US county). However, since 1971 all municipalities are officially defined as kommun, thus making no legal difference between, for instance, Stockholm and a small countryside municipality. Every urban area that was a stad before 1971 is still often referred to as a stad in daily speech. Since the 1980s, 14 of these municipalities brand themselves as stad again, although this has no legal or administrative significance, as they still have refer to themselves as kommun in all legal documentation. For statistical purposes, Statistics Sweden officially defines a stad as an urban area of at least 10,000 inhabitants. In the Swedish language the term for a major city is storstad (literally "big town"), but there is no clear definition as to when a stad should be called a storstad. Most Swedes would only call Stockholm, Gothenburg and Malmö storstäder, i.e. "major cities", although Uppsala fulfills the definition of "municipality with a population that exceeds 200 000 inhabitants". In Ukraine the term town (містечко, mistechko) existed from the Medieval period until 1925, when it was replaced by the Soviet regime with urban type settlement. Historically, town in the Ukrainian lands was a smaller populated place that was chartered under the German town law and had a market square (see Market town). Today informally, town is also referred to cities of district significance, cities with small population, and former Jewish shtetls. In England and Wales, a town traditionally was a settlement which had a charter to hold a market or fair and therefore became a "market town". Market towns were distinguished from villages in that they were the economic hub of a surrounding area, and were usually larger and had more facilities. In parallel with popular usage, however, there are many technical and official definitions of what constitutes a town, to which various interested parties cling. In modern official usage the term town is employed either for old market towns, or for settlements which have a town council, or for settlements which elsewhere would be classed a city, but which do not have the legal right to call themselves such. Any parish council can decide to describe itself as a town council, but this will usually only apply to the smallest "towns" (because larger towns will be larger than a single civil parish). Not all settlements which are commonly described as towns have a "Town Council" or "Borough Council". In fact, because of many successive changes to the structure of local government, there are now few large towns which are represented by a body closely related to their historic borough council. These days, a smaller town will usually be part of a local authority which covers several towns. And where a larger town is the seat of a local authority, the authority will usually cover a much wider area than the town itself (either a large rural hinterland, or several other, smaller towns). Additionally, there are "new towns" which were created during the 20th century, such as Basildon, Redditch and Telford. Milton Keynes was designed to be a "new city" but legally it is still a town despite its size. Some settlements which describe themselves as towns (e.g. Shipston-on-Stour, Warwickshire) are smaller than some large villages (e.g. Kidlington, Oxfordshire). The status of a city is reserved for places that have letters patent entitling them to the name, historically associated with the possession of a cathedral. Some large municipalities (such as Northampton and Bournemouth) are legally boroughs but not cities, whereas some cities are quite small — such as Ely or St David's. The city of Brighton and Hove was created from the two former towns and some surrounding villages, and within the city the correct term for the former distinct entities is somewhat unclear. It appears that a city may become a town, though perhaps only through administrative error: Rochester in Kent had been a city for centuries but, when in 1998 the Medway district was created, a bureaucratic blunder meant that Rochester lost its official city status and is now technically a town. 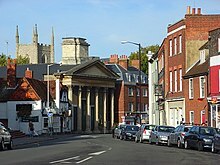 It is often thought that towns with bishops' seats rank automatically as cities: however, Chelmsford was a town until 5 June 2012 despite being the seat of the diocese of Chelmsford, created in 1914. St Asaph, which is the seat of the diocese of St Asaph, only became a city on 1 June 2012 though the diocese was founded in the mid sixth century. In reality, the pre-qualification of having a cathedral of the established Church of England, and the formerly established Church in Wales or Church of Ireland, ceased to apply from 1888. The word town can also be used as a general term for urban areas, including cities and in a few cases, districts within cities. In this usage, a city is a type of town; a large one, with a certain status. For example, central Greater London is sometimes referred to colloquially as "London town". (The "City of London" is the historical nucleus, informally known as the "Square Mile", and is administratively separate from the rest of Greater London, while the City of Westminster is also technically a city and is also a London borough.) Camden Town and Somers Town are districts of London, as New Town is a district of Edinburgh – actually the Georgian centre. A town in Scotland has no specific legal meaning and (especially in areas which were or are still Gaelic-speaking) can refer to a mere collection of buildings (e.g. a farm-town or in Scots ferm-toun), not all of which might be inhabited, or to an inhabited area of any size which is not otherwise described in terms such as city, burgh, etc. Many locations of greatly different size will be encountered with a name ending with -town, -ton, -toun etc. (or beginning with the Gaelic equivalent baile etc.). A burgh (pronounced burruh) is the Scots' term for a town or a municipality. They were highly autonomous units of local government from at least the 12th century until their abolition in 1975, when a new regional structure of local government was introduced across the country. Usually based upon a town, they had a municipal corporation and certain rights, such as a degree of self-governance and representation in the sovereign Parliament of Scotland adjourned in 1707. The term no longer describes units of local government although various claims are made from time to time that the legislation used was not competent to change the status of the Royal Burghs described below. The status is now chiefly ceremonial but various functions have been inherited by current Councils (e.g. the application of various endowments providing for public benefit) which might only apply within the area previously served by a burgh; in consequence a burgh can still exist (if only as a defined geographical area) and might still be signed as such by the current local authority. The word 'burgh' is generally not used as a synonym for 'town' or 'city' in everyday speech, but is reserved mostly for government and administrative purposes. Historically, the most important burghs were royal burghs, followed by burghs of regality and burghs of barony. Some newer settlements were only designated as police burghs from the 19th century onward, a classification which also applies to most of the older burghs. Since the Tenth Amendment to the United States Constitution largely leaves local-government organization to the individual U.S. states, the definition (if any) of "town" varies widely from state to state. In some states, the term "town" refers to an area of population distinct from others in some meaningful dimension, typically population or type of government. The characteristic that distinguishes a town from another type of populated place — a city, borough, village, or township, for example — differs from state to state. In some states, a town is an incorporated municipality; that is, one with a charter received from the state, similar to a city (see incorporated town), while in others, a town is unincorporated. In some instances, the term "town" refers to a small incorporated municipality of less than a population threshold specified by state statute, while in others a town can be significantly larger. Some states do not use the term "town" at all, while in others the term has no official meaning and is used informally to refer to a populated place, of any size, whether incorporated or unincorporated. In still other states, the words "town" and "city" are legally interchangeable. Small town life has been a major theme in American literature, especially stories of rejection by young people leaving for the metropolis. In Alabama, the legal use of the terms "town" and "city" is based on population. A municipality with a population of 2,000 or more is a city, while less than 2,000 is a town (Code of Alabama 1975, Section 11-40-6). For legislative purposes, municipalities are divided into eight classes based on population. Class 8 includes all towns, plus cities with populations of less than 6,000 (Code of Alabama 1975, Section 11-40-12). In Arizona, the terms "town" and "city" are largely interchangeable. A community may incorporate under either a town or a city organization with no regard to population or other restrictions according to Arizona law (see Arizona Revised Statutes, Title 9). Cities may function under slightly differing governmental systems, such as the option to organize a district system for city governments, but largely retain the same powers as towns. Arizona law also allows for the consolidation of neighboring towns and the unification of a city and a town, but makes no provision for the joining of two adjacent cities. In California, the words "town" and "city" are synonymous by law (see Cal. Govt. Code Secs. 34500–34504). There are two types of cities in California: charter and general law. Cities organized as charter cities derive their authority from a charter that they draft and file with the state, and which, among other things, states the municipality's name as "City of (Name)" or "Town of (Name)." Government Code Sections 34500–34504 applies to cities organized as general law cities, which differ from charter cities in that they do not have charters but instead operate with the powers conferred them by the pertinent sections of the Government Code. Like charter cities, general law cities may incorporate as "City of (Name)" or "Town of (Name)." Some cities change their minds as to how they want to be called. The sign in front of the municipal offices in Los Gatos, California, for example, reads "City of Los Gatos", but the words engraved on the building above the front entrance when the city hall was built read "Town of Los Gatos." There are also signs at the municipal corporation limit, some of which welcome visitors to the "City of Los Gatos" while older, adjacent signs welcome people to the "Town of Los Gatos." Meanwhile, the village does not exist in California as a municipal corporation. Instead, the word "town" is commonly used to indicate any unincorporated community that might otherwise be known as an unincorporated village. Additionally, some people may still use the word "town" as shorthand for "township", which is not an incorporated municipality but an administrative division of a county. The Hawaiian Island of Oahu has various communities that may be referred to as towns. However, the entire island is lumped as a single incorporated city, the City and County of Honolulu. The towns on Oahu are merely unincorporated census-designated places. In Illinois, the word "town" has been used both to denote a subdivision of a county called a township, and to denote a form of municipality similar to a village, in that it is generally governed by a president and trustees rather than a mayor. In some areas a "Town" may be incorporated legally as a Village (meaning it has at large Trustees) or a City (meaning it has aldermen from districts) and absorb the duties of the Township it is coterminous with (maintenance of birth records, certain welfare items). Evanston, Berwyn and Cicero are examples of Towns in this manner. Under the current Illinois Municipal Code, an incorporated or unincorporated town may choose to incorporate as a city or as a village, but other forms of incorporation are no longer allowed. In Louisiana a "town" is defined as being a municipal government having a population of 1,001 to 4,999 inhabitants. While a "town" is generally considered a smaller entity than a "city", the two terms are legally interchangeable in Maryland. The only exception may be the Independent city of Baltimore, which is a special case, as it was created by the Constitution of Maryland. In Nevada, a town has a form of government, but is not considered to be incorporated. It generally provides a limited range of services, such as land use planning and recreation, while leaving most services to the county. Many communities have found this "semi-incorporated" status attractive; the state has only 20 incorporated cities, and towns as large as Paradise (186,020 in 2000 Census), home of the Las Vegas Strip. Most county seats are also towns, not cities. In the six New England states, a town is a municipality and a more important unit than the county. In Connecticut, Rhode Island and 7 out of 14 counties in Massachusetts, in fact, counties only exist as map divisions and have no legal functions; in the other three states, counties are primarily judicial districts, with other functions primarily in New Hampshire, Maine, and Vermont. In all six, towns perform functions that in most states would be county functions. The defining feature of a New England town, as opposed to a city, is that a town meeting and a board of selectmen serve as the main form of government for a town, while cities are run by a mayor and a city council. For example, Brookline, Massachusetts is a town, even though it is fairly urban, because of its form of government. A "town" in the context of New Jerseyan local government refers to one of five types and one of eleven forms of municipal government. While Town is often used as a shorthand to refer to a Township, the two are not the same. The Town Act of 1895 allowed any municipality or area with a population exceeding 5,000 to become a Town through a petition and referendum process. Under the 1895 Act, a newly incorporated town was divided into at least three wards, with two councilmen per ward serving staggered two-year terms, and one councilman at large, who also served a two-year term. The councilman at large served as chairman of the town council. The Town Act of 1988 completely revised the Town form of government and applied to all towns incorporated under the Town Act of 1895 and to those incorporated by a special charter granted by the Legislature prior to 1875. Under the 1988 Act, the mayor is also the councilman at large, serving a term of two years, unless increased to three years by a petition and referendum process. The Council under the Town Act of 1988 consists of eight members serving staggered two-year terms with two elected from each of four wards. One councilman from each ward is up for election each year. Towns with different structures predating the 1988 Act may retain those features unless changed by a petition and referendum process. Two new provisions were added in 1991 to the statutes governing towns, First, a petition and referendum process was created whereby the voters can require that the mayor and town council be elected to four-year terms of office. The second new provision defines the election procedure in towns with wards. The mayor in a town chairs the town council and heads the municipal government. The mayor may both vote on legislation before council and veto ordinances. A veto may be overridden by a vote of two-thirds of all the members of the council. The council may enact an ordinance to delegate all or a portion of the executive responsibilities of the town to a municipal administrator. Fifteen New Jersey municipalities currently have a type of Town, nine of which operate under the town form of government. In New York, a town is similarly a division of the county, but with less importance than in New England. Of some importance, a town provides a closer level of governance than its enclosing county, providing almost all municipal services to unincorporated communities, called hamlets, and selected services to incorporated areas, called villages. In New York, a town typically contains a number of such hamlets and villages. However, due to their independent nature, incorporated villages may exist in two towns or even two counties (example: Almond (village), New York). Everyone in New York who does not live on an Indian reservation or a city lives in a town and possibly in one of the town's hamlets or villages. (There are no towns in the five counties – also known as boroughs – that make up New York City.) What is a "town" in New York is called a township in some other states. In North Carolina, all cities, towns, and villages are incorporated as municipalities. According to the North Carolina League of Municipalities, there is no legal distinction among a city, town, or village—it is a matter of preference of the local government. Some North Carolina cities have populations as small as 1,000 residents, while some towns, such as Cary, have populations of greater than 100,000. In Pennsylvania, only one municipality is incorporated as a "town": Bloomsburg. Most of the rest of the state is incorporated as townships (there are also boroughs and cities), which function in much the same way as the towns of New York or New England, although they may have different forms of government. In Texas, although some municipalities refer to themselves as "towns" or "villages" (to market themselves as an attractive place to live), these names have no specific designation in Texas law; legally all incorporated places are considered cities. In Utah, the legal use of the terms "town" and "city" is based on population. A municipality with a population of 1,000 or more is a city, while less than 1,000 is a town. In addition, cities are divided into five separate classes based on population. In Virginia, a town is an incorporated municipality similar to a city (though with a smaller required minimum population). But while cities are by Virginia law independent of counties, towns are contained within counties. Wisconsin has Towns which are areas outside of incorporated cities and villages. These Towns retain the name of the Civil Township from which they evolved and are often the same name as a neighboring City. Some Towns, especially those in urban areas, have services similar to those of incorporated Cities, such as police departments. These Towns will from time to time incorporate into Cities, such as Fox Crossing in 2016 from the former town of Menasha. Often this is to protect against being annexed into neighboring cities and villages. Wyoming statute indicates towns are incorporated municipalities with populations of less than 4,000. Municipalities of 4,000 or more residents are considered "first-class cities". In Vietnam, a district-level town (Vietnamese: thị xã) is the second subdivision, below a province (tỉnh) or municipality (thành phố trực thuộc trung ương). A commune-level town (thị trấn) a third-level (commune-level) subdivision, below a district (huyện). ^ "A dictionary of the Puk'hto, Pus'hto, or language of the Afghans". dsalsrv0 2.uchicago.edu. Retrieved 2018-05-04. ^ "Consolidated version of Law no. 128/200 Coll". Zakonyprolidi.cz. 2000-05-15. Retrieved 2018-04-18. ^ "Byopgørelsen pr. 1. januar – Varedeklaration – Danmarks Statistik". Dst.dk. 2005-03-22. Retrieved 2010-08-06. ^ "Some Concepts and Definitions" (PDF). Census of India. Retrieved 7 February 2015. ^ "Law n.º 11/82 (Lei das designações e determinação de categoria das povoações), of June, 2nd" (PDF). Archived from the original (PDF) on 2010-06-08. Retrieved 2010-08-06. ^ "Portuguese municipal flags". Flags of the World. Crwflags.com. ^ "Bilaga 1. Begrepp och definitioner" (PDF) (in Swedish). ^ See the Township Code, 60 ILCS 1 et seq. ^ See generally Article 2 of the Illinois Municipal Code, 65 ILCS 5/2‑1‑1 et seq. ^ "Individual State Descriptions: 2002" (PDF). Retrieved 2018-04-18. ^ "How NC Cities Work". North Carolina League of Municipalities. Archived from the original on 2010-05-16. ^ "Utah Code, Title 10, Chapter 2, Section 301". Utah State Legislature. Archived from the original on August 8, 2011. Retrieved May 11, 2010. ^ Charles A. Grymes. "County vs. Town vs. City in Virginia". Archived from the original on 2010-06-20. Retrieved 2011-05-31. Cities own and maintain their roads, while Virginia counties (except for Arlington and Henrico) rely upon VDOT for road maintenance. Cities get a fixed allocation of state funding for building and maintaining those roads, while counties must compete with each other and other VDOT priorities for a substantial portion of their road budget. Cities have been granted more authorities, such as the right of city councils to issue bonds to build roads without a voter referendum (counties must get voter approval in a referendum before issuing road bonds)... In Virginia, towns have distinct boundaries, established by the General Assembly or by courts guided by laws passed by the legislature. Towns are *not* independent from counties; residents of towns are still residents of the county in which the town is located. For example, residents of the four towns of Haymarket, Quantico, Dumfries, and Occoquan are also residents of Prince William County. They pay both town and county property taxes, and town residents get to vote for a town council/mayor. ^ "Classification of Washington Cities". Municipal Research and Services Center of Washington. Retrieved December 14, 2012. 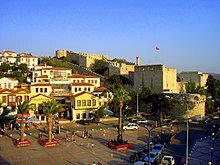 ^ "A Comparison of the Powers of a Town and a Noncharter Code City". Municipal Research and Services Center of Washington. Archived from the original on July 25, 2008. Retrieved December 14, 2012. Look up town in Wiktionary, the free dictionary. Open-Site Regional — Contains information about towns in numerous countries. This page was last edited on 19 April 2019, at 18:46 (UTC).